Scones are a small quickbread made of wheat, barley or oatmeal, usually with baking powder as a leavening agent. Tart blueberries are an excellent complement to this little snack bread. 1. Preheat oven to 375°F. Lightly grease a large baking sheet. 2. In a bowl, combine biscuit mix and sugar. With a wooden spoon, stir in milk until mixture forms a ball. On lightly floured board, flatten dough. Pat or roll out dough to make a 14- X 7-in. rectangle. Scatter blueberries over half of the dough; fold over remaining half of the dough. Gently press to a uniform thickness. 3. 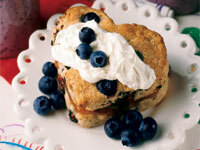 Cut dough with small heart-shaped cookie cutter into 16 mini-scones. 4. Arrange mini-scones on the baking sheet. Bake in upper third of oven until browned on top, 8-10 min. Serve warm, topped with whipped cream.